For really tough iron contamination, try McKee's 37 Xtreme Iron Remover. It's pH-balanced and 100% acid-free, so you can use it on every exterior surface with confidence. Simply spray this powerful cleaner directly onto any exterior surface and wait a few minutes for it to turn red as it dissolves ferrous (iron containing) particles, leaving your paint glossy, smooth, and bright. Then, wash your vehicle as you normally would and then apply a coat of your favorite wax or sealant. 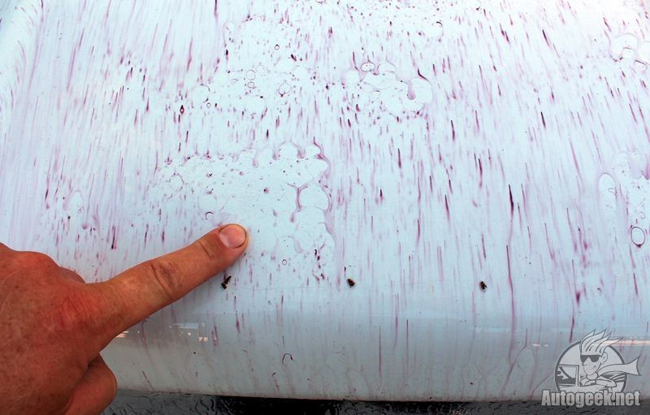 Your vehicle’s paint will appear glossier than it ever has! McKee's 37 Xtreme Iron Remover begins to dissolve corrosive iron particles on contact. The color-changing formula lets you see it in action! McKee's 37 Foaming Wheel Cleaner Gel 128 oz. GTechniq W6 Iron and General Fallout Remover 250 ml. Optimum FerreX Iron Remover 128 oz. Dodo Juice Ferrous Dueller Iron Remover 500 ml. Optimum MDR Mineral Deposit Remover 8 oz. Optimum MDR Mineral Deposit Remover 32 oz. SONAX Wheel Cleaner Full Effect 16.9 oz.